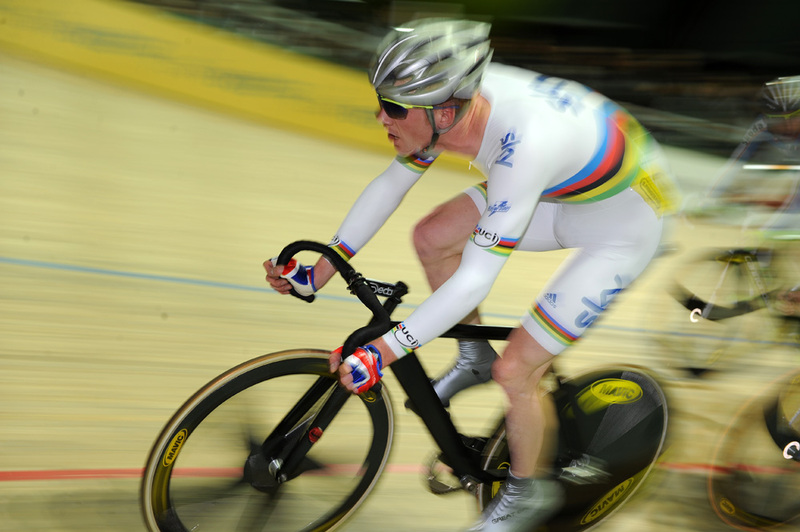 Ed Clancy has been the one constant in Great Britain’s continually evolving team pursuit quartet. The 25-year-old has watched with interest as the young Australian team has continued to close the gap in the past year. However, he is determined to remind the world that Great Britain are the Olympic champions and he hopes the return of Geraint Thomas and Bradley Wiggins at the Manchester World Cup this weekend will help do it. In the meantime, Clancy has an eye on the omnium at the London Olympics. Cycling Weekly caught up with him to see what’s on the horizon. CW: You’re the omnium world champion and you have done very well this season but do you consider yourself the favourite to represent Britain in the omnium at the London Olympics in 2012? EC: First things first, is the way I’m looking at it. First of all, we have to qualify for a place at the Olympics and I am the rider who’s been doing that. When they first announced the Olympic omnium would feature a full-length points race, a full-length scratch race and a devil, I wasn’t sure it was for me. But I was fourth in the Euros, third and first in the two World Cups this year so for sure I am starting to look at it more seriously. It ties in quite well with the fact I am trying to move my focus to the road. Do you think it’s possible to do the team pursuit and the omnium at the Olympics? EC: It’s feasible, yes. I am not going to say now that I definitely would do it but so far I’m the only one who’s ridden it. There’s Geraint [Thomas], Swifty [Ben Swift] or Pete [Kennaugh] who could come in and show they’re the man for it. [Since this interview, Sam Harrison won gold for Great Britain in the omnium at the Beijing World Cup] It’s out of my hands but with there being a rest day between the team pursuit and the start of the omnium at the Olympics, it is possible to double up. It’s clear your strongest events are the timed events, do you see that as an advantage? EC: I can always get off to a decent start with a good flying lap. Nine times out of 10 I can finish in the top three or four and so you’re off. But then you follow that with the points race, which is my worst event. I was taking such a kicking in the points and scratch at the Worlds [in Copenhagen last March] it was ridiculous but I’ve taken a step forward each time I’ve raced. At Cali [the World Cup before Christmas] I was 10th in the points, fourth in the scratch and devil, so I am getting better. The thing is, being good at the timed events is an advantage because anything can happen in the bunch races so if you are solid in three events it’s a big help. I’ve been working with Dan [Hunt, the British Cycling coach] on tactics but even one disastrous bunch race isn’t always bad. I bombed in the bunch races at the Euros and ended up one place away from a medal. Tactically, the omnium bunch races look very confusing. Do you concentrate on three or four riders? EC: That’s exactly it. It’s impossible to follow eight people anyway. I will go in with a strategy and hope to keep an eye on certain people. Someone like Tim Veldt [Netherlands] is very similar to me so I won’t want to give points away to him because he’s playing the same game as me. But a guy who’s only going to finish 10th in the flying lap or kilo, I don’t need to worry so much. In the points race, I’m not one of the strongest, in fact I’m one of the weakest, so I have to pick my moments. Geraint Thomas once told us the omnium is a kids’ event, great for learning at the track league but no with business in the Olympics. EC: Initially I was disappointed they took the individual pursuit out of the Olympics. I thought it was a stupid decision. We’ve lost a lot of male endurance events. Chris Newton has lost the points race. Even though it has worked well for me, I still wouldn’t say it was a good decision. When it was announced the omnium was in the Olympics, people’s perceptions changed. Now the crowds are getting behind it and public opinion is coming round. The devil, or elimination race, looks too random. Isn’t it too difficult for the commissaires to get right for an Olympic medal to hinge on it? EC: They are working on it. We have a little red light on our handlebars now that flashes when you are out and there are timing chips on the forks but if it’s really close, people will want to stay in. In one World Cup there was a four-up sprint and no one knew who had it. I’d done another lap before my light flashed and I dropped out. But in that lap, what was I doing? Was I impeding someone else? Not intentionally but until your light flashes you keep racing, and if it takes a lap for the commissaires to work out…? I don’t know. I don’t think it’s an Olympic standard event. How have you assessed the Australian progress of late? EC: I’d say it was inevitable. I knew they’d come back. Beijing wasn’t their usual high standard. What they are doing now, with a young group, is pretty good. But I don’t think they’re doing anything that we can’t do. Far from it, although I do think 2012 will be a close race. The team pursuit was in danger of becoming no more than a four-kilometre team time trial. It was getting to the stage where our motto was to get up and tick the boxes. I’d do a 12.7 first lap, then we all knew what we had to do, we’d finish in a certain formation. Now we’re going to have to get up and race it, for sure. With Brad and G coming back for the Manchester World Cup we want to show that we’re still here. If we can do a 54 or a 55 off the back of a couple of months’ work we’ll remind everyone who we are. If you had to name the Great Britain quartet for London now, who would it be? EC: It’s all to play for. There are six or seven guys in it but it’s likely to be myself, Burke, G, Brad and Tennant as your core five, but you have Kennaugh, Rowe, Swift. Thing is, at this point out from Beijing, me and G were very much on the fringes. We weren’t doing anything that Luke Rowe isn’t doing now, put it that way.